Wow, this hits all of my core competencies: Food Trucks, Beer Dinners and Baseball. Das Bullpen will be hosting a 3-hour beer dinner on August 27th with Sierra Nevada and Dogfish Head breweries, as well as the tasty deliciousness of Cap Mac, Porcmobile, Stix, Hula Girl, Doug the Food Dude, and Eat Wonky. 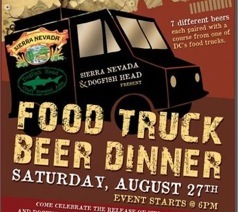 Sierra Nevada and Dogfish Head will also have Life and Limb, their co-operative brew, on taps all night. Tickets are $75, and benefit Living Classrooms, which provides hands-on job training programs for those who need them most. Get your tickets early, I’m better this is going to sell out.